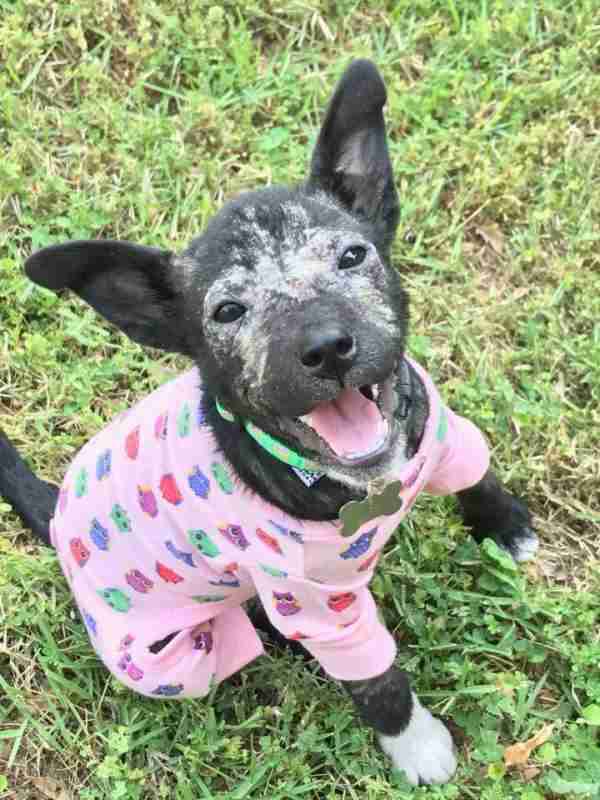 She was covered in mange and had nothing but an old tire as a home — but she still found a reason to smile. 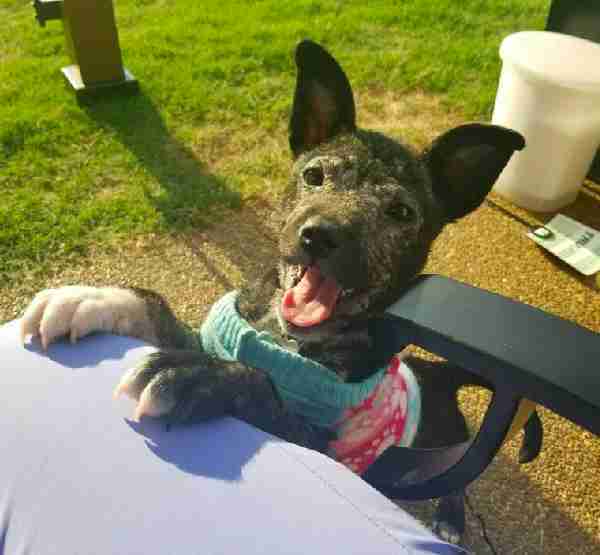 Workers at a warehouse near Memphis, Tennessee, had seen the tiny puppy hiding out near their job for a few days and started leaving food out for her. 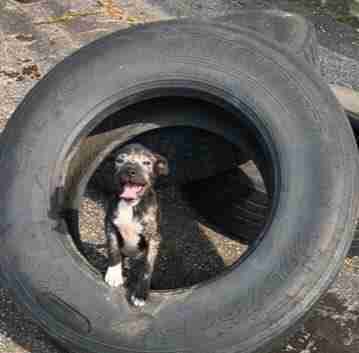 She was too shy to let them get close enough to pick her up, but she smiled at them from inside her tire. They took her picture and posted it online to see if anyone could help. Michelle Quina, foster coordinator for Streetdog Foundation, rushed out immediately after seeing the post to try to find the dog. The nearby street was always very busy with trucks from the warehouse, so Quina knew the puppy could be in danger if she got spooked and ran into the road. Rescuers named her Panama after the name of the street she was found on. If her obvious grin was any indicator, she was more than happy to be safe. 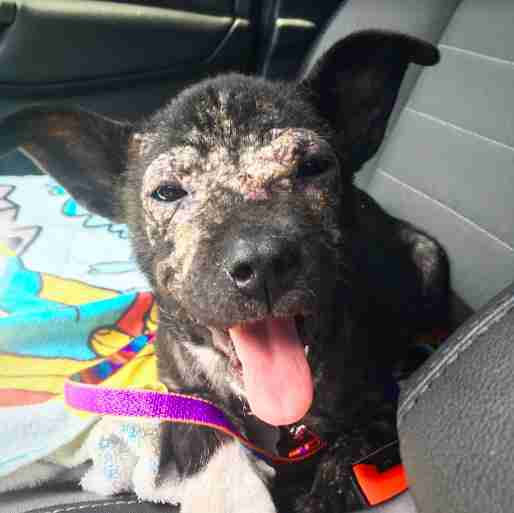 Quina took Panama to the vet for a checkup, where she was diagnosed with demodex mange and worms. 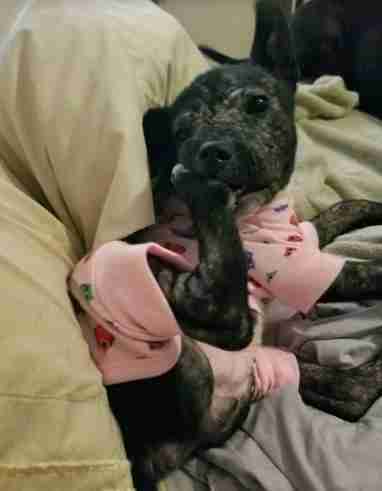 Since her mange was very advanced, but not contagious, Quina brought her home as a foster to start her recovery. 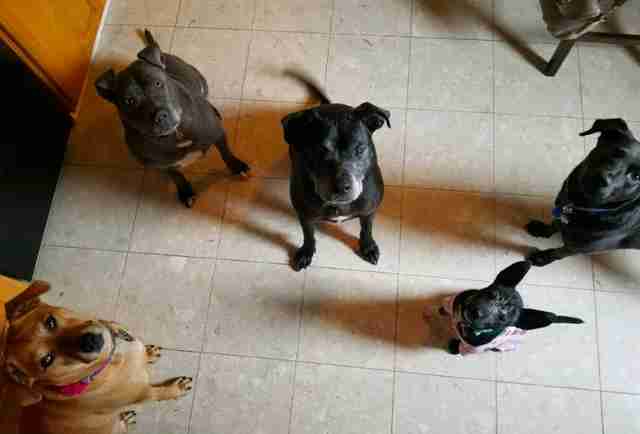 So far, she’s loved playing with Quina’s dogs and meeting every new person who comes to visit her. Although she’s only 14 weeks old, Panama is almost completely potty-trained and already knows a few tricks. To Quina, that’s a big giveaway that she was once someone’s pet. 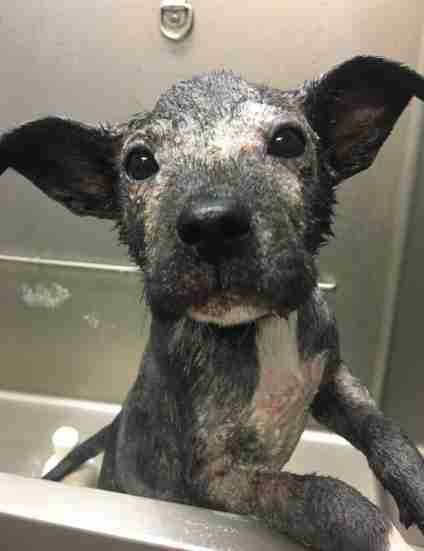 To get her skin cleared up, Panama goes to the vet every few days for a medicated bath. She’s also been sporting brightly-colored onesies to ensure she doesn’t keep scratching her sensitive back. “She has like seven different outfits already,” Quina said. While it will take at least a few months for Panama’s skin to fully heal, she will be available as a foster-to-adopt in the coming weeks to a family who can keep up with her regular medication and vet appointments. Until then, she’s learning just how fun it is to be a puppy — and flashes that adorable grin every chance she gets. To help more dogs like Panama find great homes, you can make a donation to Streetdog Foundation.